The scandal involving Ezzati goes back to 2010, when victims said one of Chile's most famous preachers, the Rev. Fernando Karadima, molested children for years, according to The Associated Press. 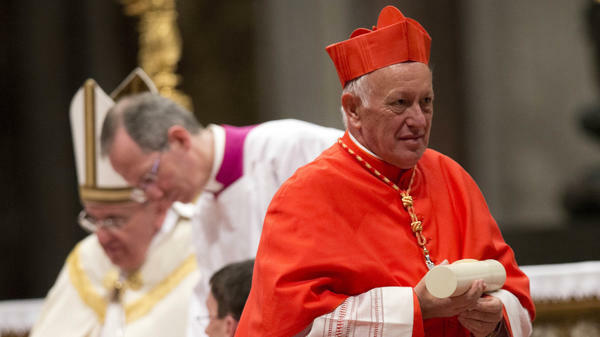 Ezzati and his predecessor, Cardinal Francisco Javier Errázuriz, have been accused of covering up Karadima's actions. The AP reports, "Pollsters have cited the Father Karadima scandal as the tipping point in the Chilean church's progressive loss of credibility among ordinary Chileans." Francis became embroiled in the scandal during a 2018 trip to Chile when he accused the sexual abuse victims there of "slander," and said they should present proof of their claims. After Vatican investigators produced a 2,300-page report alleging the cover-up of abuse claims in Chile, Francis apologized, and said investigators were "overwhelmed by the pain of so many victims." Francis summoned Chile's bishops to an emergency meeting last May at the Vatican. All of the country's 34 bishops offered to resign during that meeting, and Francis has accepted the resignations of eight, including Ezzati, since then. Francis has named Monsignor Celestino Aos Braco as a temporary replacement for Ezzati. Juan Carlos Cruz, who was sexually abused by a Chilean priest, spoke with NPR's Ari Shapiro on All Things Considered after the Vatican conference. Cruz said, "Unfortunately we've had too many examples, mine included in Chile, of bishops that can see the worst crimes, yet they cover it up and don't do the right thing and disappear documents. And so I know that there's been a lot more awareness and accountability, but it hasn't shown that this self-policing works." Cruz continued, "Pope Francis of 2017 is not Pope Francis of 2019. He's a man that has been able to listen and change and understand better. What I worry about are the bishops that go back home and, you know, remain the same. And that's my biggest worry."